To view our current inventory of Royal Navy antique medals and uniforms, clock here! Date Instituted: Second Type -1848. 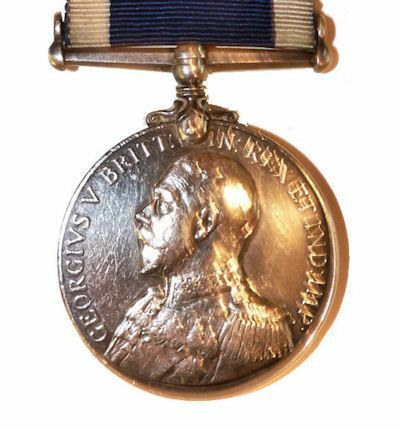 DESCRIPTION of this MEDAL: Round medal bearing the head of King George V on the obverse with the inscription 'GEORGEIVS V REX BRITTIAN REX ET IND. : IMP' while the reverse depicts a three masted ship of war. Above the ship are the words 'FOR LONG SERVICE AND GOOD CONDUCT'. The suspender is a fixed bar to take the ribbon. On the edge of the medal, the recipient's number, name, rank, ship or station are engraved along the edge. Metal: Silver. Size: 36mm diameter. Clasp: For 30 years after 1901. 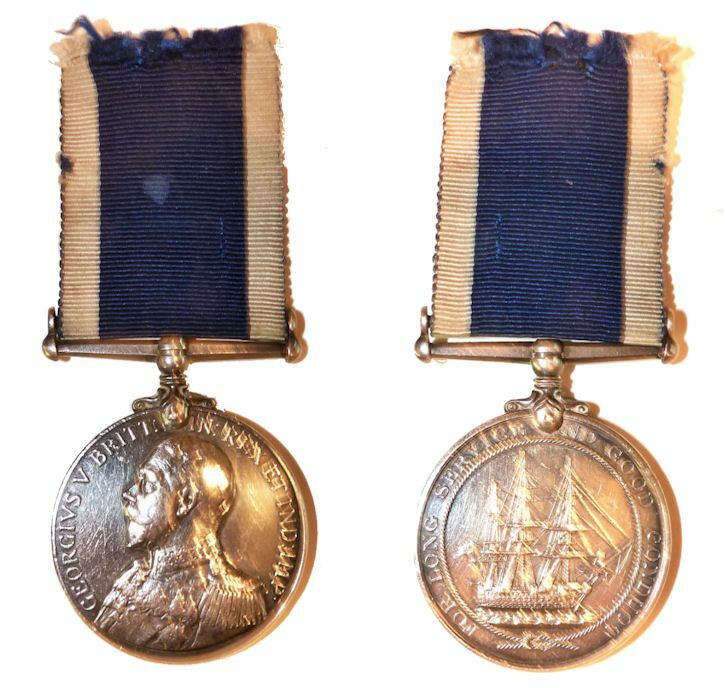 NAVAL LONG SERVICE & GOOD CONDUCT MEDAL HISTORY - NAVY: This medal was introduced on 24 August 1831. It is silver and circular in shape. The medal of 1831 had on its obverse side an anchor surmounted by a crown and enclosed in an oak wreath. The medal's reverse side was engraved with the recipient's details. The medal being sold is of the 1848 style. The silver medal has changed dimensions and ribbon colour twice during its period of issue. The original medal of 1831 was 34mm in diameter and was suspended from a ring by a dark blue ribbon. In 1848 the medal became 36mm in diameter with a dark blue ribbon with white edges. A narrow suspender was introduced in 1874. 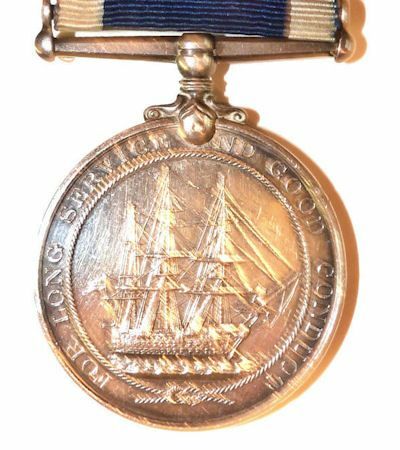 Today, the Long Service & Good Conduct Medal (Navy) is based on the pattern of 1848. The obverse of the medal shows the effigy of the reigning monarch, while the reverse shows the image of a three-masted man-of-war surrounded by a rope tied at the foot with a reef knot with the words 'For Long service and Good Conduct' around the circumference. An Other Rank who completes 15 years of reckonable service from the date of attestation or age 17½, whichever is later, and who holds all three good conduct badges, shall be eligible to receive the medal. However, there are a number of offences which would normally preclude award of the LS&GCM. Awards are only made after a thorough check of a sailor's record of service. A Clasp to the medal was introduced during the reign of King George V (1831-1954) and can be awarded for an additional fifteen year's service. The Clasp bears a laurel leaf design. When the ribbon alone is worn, a silver rosette denotes award of the Clasp. The medals' ribbon is dark blue flanked at the edges by narrow stripes of white. CONDITION: The ribbon appears to have been cut from a uniform and has a ragged top edge. The lighter color in the center is an old spot of dried glue. 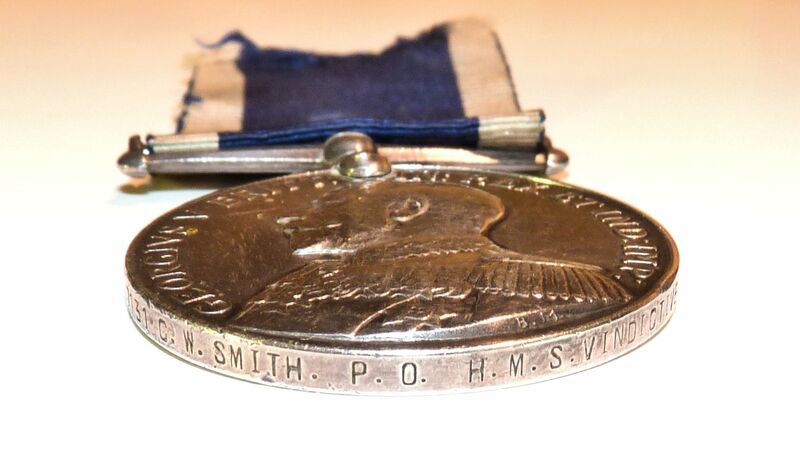 The medal is in fine condition with a few tiny nicks on the front showing it was worn with other medals. Otherwise the medal is in Very Fine condition showing only handeling and has a nice patina of age.